PPHS junior Cason Payne (7) splits a pair of Westside defenders during the first half of the Big Blacks’ regular season finale on Friday night in Point Pleasant, W.Va.
More treats than tricks on this Halloween weekend. Point Pleasant ended up one point short of the program’s all-time scoring total in a game on Friday during a 75-14 thumping of visiting Westside on Senior Night at Ohio Valley Bank Track and Field. The Big Blacks (8-2) led 28-0 after one quarter of play and produced their highest offensive output of the season en route to the 61-point triumph. 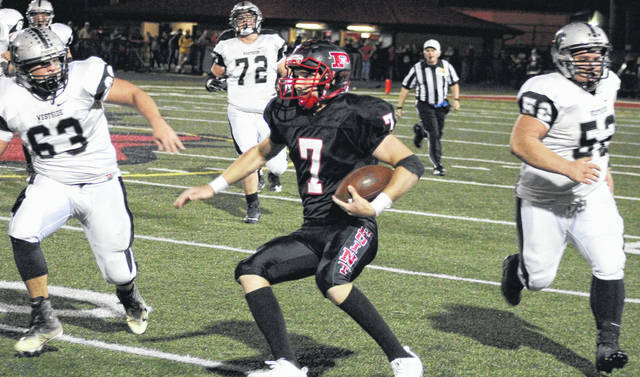 PPHS set its all-time scoring mark in Week 5 of 2015 with a 76-29 victory at Gallia Academy. Point Pleasant also reached the 70-point plateau against both Lincoln County (70-14) and Sissonville (75-7) in 2013 and 2011, respectively. The 75-point outburst on Friday night is also a program-best for Point Pleasant at OVB Field, eclipsing the previous mark set against Lincoln County back in 2013. Hannan dropped its fourth consecutive decision on Friday night with a 50-0 setback to host Phelps in the Bluegrass State. The Wildcats (2-7) have mustered only a dozen points during their current four-game skid. Hannan completes its 2017 campaign next Friday when it hosts Cameron at the Craigo Athletic Complex at 7:30 p.m.
Wahama, coming off a bye week, finishes its season on Friday when it travels to Buffalo for a 7:30 p.m. kickoff. Point Pleasant has a Week 11 bye before beginning its 10th consecutive season in the playoffs. The Big Blacks have at least one victory in each of the last four postseasons. Due to an early deadline, the Mason County gridiron games from Week 10 will be available in the Tuesday sports edition of the Point Pleasant Register. Game stories will be available online at mydailyregister.com before appearing in print.